Rachel Shirrel Hall Dobson was born September 21, 1935 in Green County, KY to the late Bedie and Emma Chaudoin Hall. She departed this life Friday, November 30, 2018 at Green Hill Nursing and Rehabilitation Care, Greensburg, KY, having attained the age of eighty-three years, two months and nine days. 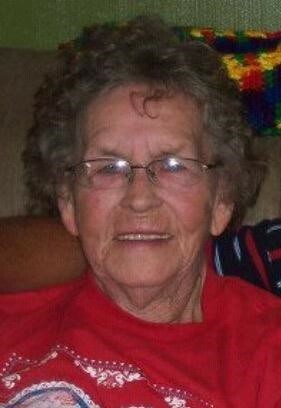 She had made a profession of faith in Christ and was a member of the Oak Forrest Cumberland Presbyterian Church. She was a homemaker. She was united in marriage September 13, 1951 to Quincey Dobson, who preceded her in death September 29, 2011. She was preceded in death August 1, 2015 by her son: Barry Dobson. Also preceding her in death is an infant daughter: Kathy Lynn Dobson and three sisters: Irene Walker, Wilma Durrett and Mathis Altman. She is survived by one son and daughter-in-law: Philip and Linda Dobson of Greensburg, two brothers and one sister: Janetta Milby of Summersville, Ray Hall of Campbellsville and Leland Hall and his wife Barbara of Science Hill, one brother-in-law: V.T. Altman of Greensburg, sister-in-law: Nedie Martin and her husband Avery of Glasgow, two grandchildren: Josh and Jennifer Dobson and Samara and Robbie Bell and four great grandchildren: Grady and Ethan Dobson and Austin and Mattie Bell, plus a host of other relatives and friends. Visitation: 5 p.m. until 8 p.m. Central Time Saturday and after 7 a.m. Central Time Sunday at Foster-Toler-Curry Funeral Home. The family has requested that expressions of sympathy be donations to the Wilson Cemetery Fund. These can be made at the funeral home.